Mario's down smash in Melee. 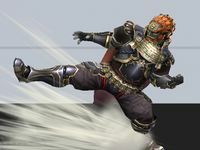 The first part of Ganondorf's down smash, he kicks in front of him. 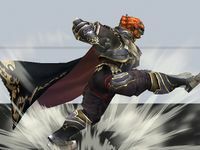 The second part, Ganondorf kicks behind him. Olimar's down smash in Super Smash Bros. 4. Down smash (abbreviated d-smash) or down smash attack (下スマッシュ攻撃, Down/lower/under smash attack) is a smash attack performed by any character by tapping the Control Stick downward and pressing A at the same time or by pressing down on the C-stick. In Super Smash Bros. Melee, the C-stick can not be used in one-player mode. It is generally an attack that hits low to the ground and hits on both sides of the character performing the attack. Since Super Smash Bros. Melee, like all smash attacks it can be charged by holding down the A button for up to one second, resulting in higher damage and knockback. A typical attribute of a down smash is that they hit both the front and rear of the user, making them useful for coverage, and are generally the fastest smash attack for most characters. Most down smashes will attack the front and back in an alternating fashion, such as Mario's, where he does a spin to kick enemies, but a few can hit both areas at the same time, such as Fox's, where he does "the splits" to kick the area in front of and behind him in one motion, and a select few only hit in front of the user, as is the case with Lucas' and Mewtwo's. The disadvantage to most down smashes is that they tend to have lower knockback than either the character's up or forward smashes, and they have the least amount of flexibility out of all smash attacks in when they can be used, as they can only be performed while walking, standing, or crouching (a feat already shared with all other moves), while up smashes can be performed out of a run or jump (enabling it to be used out of shield with no delay), and forward smashes can be used during the first few frames of a dash or during a turn-around animation (in Smash 4 only). 1 List of down smashes in Super Smash Bros. List of down smashes in Super Smash Bros.
Mario Does a breakdancing sweep. Mario swirls around while breakdancing on both sides. A decent spacing and KO-ing move. 17% if it hits in the front. Pikachu Does a breakdancing sweep. Considered the strongest down smash in the game in terms of knockback. This is a slightly less powerful version of the side smash, and seldom used outside of mindgames. However, it is still very powerful and it can be used to punish excessive rolling. 10-16%, where the forward hit does 16, and back hit does 13. Samus Extends her leg and twirls. Good spacing move or KO-ing if done near the ledge. 16%. Note: In Smash 64, down smashes are generally considered the least useful smash attacks of the three for every character due to their lack of versatility outside of tech-chases and roll punishes. Rosalina & Luma Rosalina: Kicks in front and behind herself, creating magic galaxies with each kick. Luma: Kicks on either side of itself. Sweeping: The character attacks one side of their body, then another. Best used to cover potential spotdodges and rolls. One-sided: The character attacks only hits the front side. Best used at the ledge for covering certain edge recovery options. Simultaneous: The character attacks both sides of his/her body at the same time. Best used to punish cross-ups and ambiguous landings. Special: Exclusive to Snake in Brawl, he plants an explosive on the ground that explodes when someone sets it off or he does another down smash. Peach's down smash in Melee. Peach's down smash in Melee is arguably the most feared of all smashes due to its knockback, quick start up, and extremely high damage. It deals very high knockback all-around, sends opponents on a semi-spike trajectory, and if its multiple hits land (usually caused by the opponent crouch cancelling), it can theoretically deal as much as 64.96% fully charged. The move was severely nerfed in Brawl, and became near useless outside of interrupting attacks. Samus's down smash is notable for its low lag, high base knockback, moderate knockback scaling, and semi-spike trajectory, which can potentially KO characters with poor recoveries at 0%. In Smash 4 however, it is one of the weakest down smashes. Sheik's down smash, despite its poor KO power, is a decent tech-chase option against the space animals and Captain Falcon. It is additionally a good option out of a crouch cancel or forward tilt. Donkey Kong's down smash in Brawl and SSB4 has decent start-up and range, as well as high vertical knockback, KOing at 100%. It is excellent for punishing rolls and laggy attacks out of shield. Olimar's down smash is the only "simultaneous" down smash in Brawl and Smash 4 that can hit twice, giving it very good damage racking utility (although it only works if Olimar is touching his opponent, which itself is situational.) Also it hits once if Olimar only have 1 pikmin. Snake's down smash in Brawl allows him to plant a mine, which does no damage unless stepped on (this includes Snake), and is deactivated when he plants another or is KO'd. If for any reason the mine falls from the platform it was on, it detonates on impact with anything. Zelda's down smash is the fastest down smash in Melee, tied with R.O.B. 's in Brawl (both out on frame 4), and second fastest in SSB4. It also takes less than one second to use in all three games. Meta Knight's down smash is tied with Wolf's for the second fastest down smash in Brawl, and is the fastest in SSB4, coming out on frame 4 when buffered. Unbuffered, it is again tied with Zelda's. Ness's down smash in Melee and Brawl has unique properties when charged. Rather than at the beginning of the attack, it is charged up in the middle of the attack, but only if Ness' yo-yo comes to rest on a flat surface. Charging the smash does not increase damage or knockback, but opponents can be damaged while the move is charging. It regained its charging hitbox in Ultimate while keeping the multi-hit properties of its SSB4 incarnation, and it no longer has to make contact with a surface to activate, allowing it to cover under the ledge with a deadly semi-spike. Charizard's down smash in both Brawl and SSB4 has good range as it acts somewhat like Donkey Kong's Hand Slap, creating a damaging shockwave around the Pokémon. This can hit opponents that aren't in contact with Charizard's body (including foes in the air close to it). Villager is the only fighter to have a down smash that can never KO under any circumstances when grounded, as it only buries opponents on hit. Mega Man's down smash is one of the strongest down smashes in SSB4 if the opponent is hit by the move in the early frames. It can KO as early as 60% if fully charged, although it loses power after the first few frames and has considerable ending lag. Little Mac's down smash, despite its middling knockback, can hit foes near the edge, capable of 2 framing when timed correctly. Combined with its semi-spike trajectory and low startup/endlag, it is one of his safest edgeguarding moves. Shulk's down smash, when boosted with the Buster Monado Art, is capable of breaking full shields if an opponent is cornered against a ledge and all three front hits connect. Ganondorf, Toon Link, Mii Gunner and Cloud's down smashes drag opponents in with the front hit, and naturally combo into the second, stronger back hit. Based on an opponent's DI, percentage and hitbox in which the first hit connects, these fighters can cause an unconventional stage spike by starting the attack beside a ledge and dragging an opponent right into the stage's wall. Robin's down smash only hits on both sides, with a small hitbox on the back, if the Levin Sword is active. Mewtwo's down smash is the only down smash in Melee that does not cover both the front and rear of the user. Zero Suit Samus's down smash only hits the area in front of her, and deals very little knockback, but paralyzes whoever is hit by it, opening up a chance for a follow up attack and guaranteeing a KO at high percentages. The knockback is overridden by any other knockback during the stun. Lucas's down smash only reaches a very short distance behind him; characters must be almost touching him to be struck by the rear hitbox. Because of this, it is considered to be one-sided, although the rear hitbox is very noticeable in battle. Ryu's down smash only hits in front of him and is the safest of all his smash attacks. However, it deals extremely mediocre knockback, KOing at 190%, and is usually used for forcing opponents away if they come too close. Bayonetta's down smash comes down in front from above her, but it nonetheless does not cover her from behind. Olimar's down smash hit both sides at the same time, but it can only hit in front of him whem he has one pikmin. Bayonetta's down smash is the first down smash in the Smash Bros. series to be a conventional meteor smash. Mr. Game and Watch's down smash is infamous for having fast startup and low endlag while burrying opponents when sweetspotted. Even its sourspot possesses good power and sends at an awkwark angle offstage. Ridley's, King K. Rool's, and Incineroar's down smashes all shift their hurtboxes upwards, almost as though they were performing a shorthop down aerial, allowing them to dodge and punish certain attacks, most notably grabs. Infamously, King K. Rool's down smash utilizes Belly Super Armor and deals immense shield damage on top of its extreme knockback, making it difficult to punish. This page was last edited on April 21, 2019, at 12:49.